While the children of Australia are already well into the new term at school, mums everywhere will relate to the hilarious show of back-to-school joy shared by one US mum. 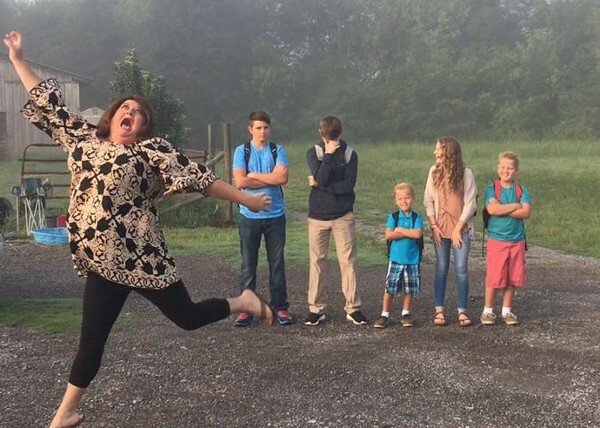 Keshia Gardner from Alabama posted two photos of herself leaping into the air, with five of her children ready to head off to school in the background. “Happy first day of school kids. I’m gonna miss y’all,” the caption reads. The Facebook post has received more than 170,000 reactions, 10,000 comments and been shared more than 270,000 times. If ever a picture told a story, it’s this one, from the expression of elation on mum’s face to the mixed looks of embarrassment, amusement and utter shame on those of her children. As much as you love time with your children, are you a mum who celebrates their return to school? And when they’re back, do you commit any of the cardinal sins of school drop off?